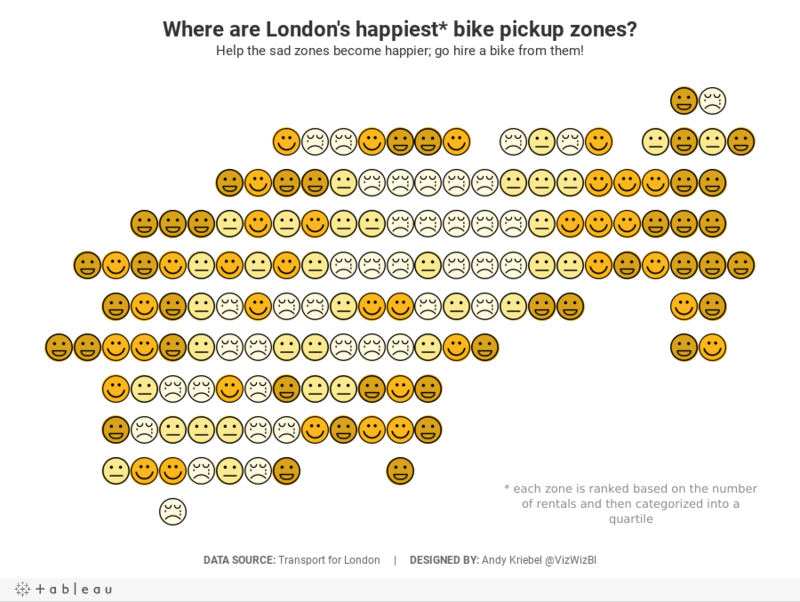 Makeover Monday: Where are London's happiest bike pickup zones? While I was running to work today along the Thames toe path, I had an idea! I wanted to create a hex map or grid map or some type of grouping of stations to represent the stations in clusters rather than showing every station on a map. You then makes the continuous dimensions and place them on the appropriate shelves (Round Lon on Columns and Round Lat on Rows). I then created a calculation that ranks each "zone" by the number cycle hires and then places them into percentiles. I then take the percentiles and break them up into happiness quartiles. I set the Location Happiness to discrete, placed it on the Shapes shelf and applied my emoticon shapes. I then duplicated the Round Lat field on the Rows shelf and moved the Location Happiness field to color, changed the shape to circle, moved the marks to the back and assigned colors. Simple! I like how this turned out. 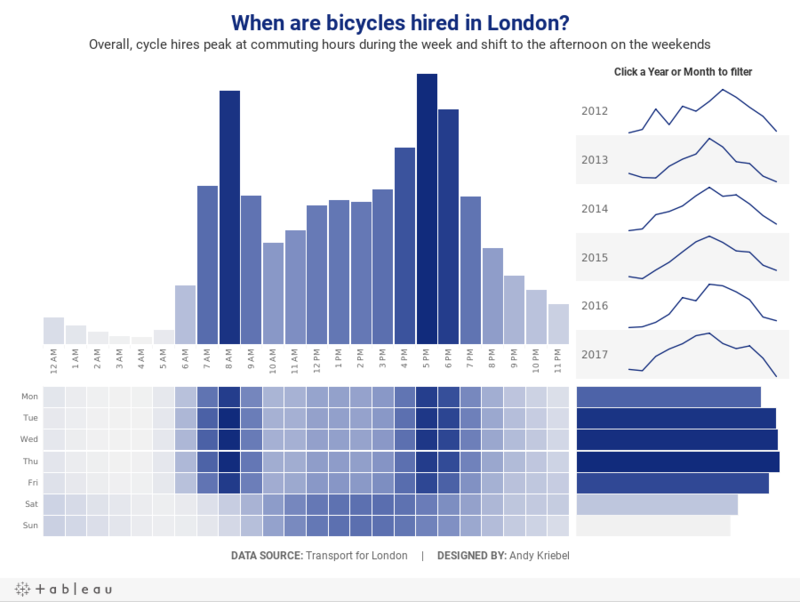 Makeover Monday: When are bicycles hired in London? The weather has been wonderful here in London lately, with really warm temperatures expected later this week. I take advantage of the weather by cycling to work whenever I can. It not only helps the environment, it's good for my health, it's good for my mind, and cycling commuting saves me time and money. 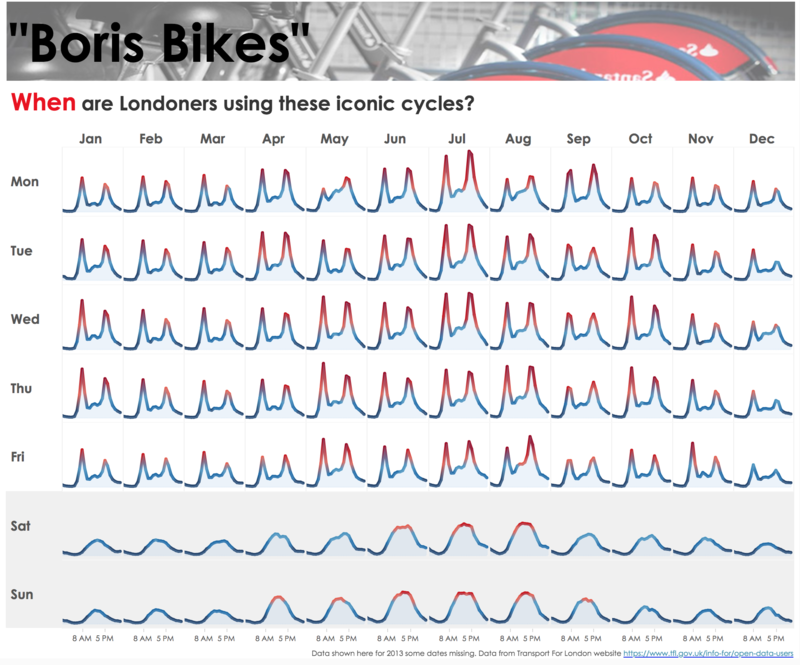 I asked Eva to use data from Transport for London's open API about their cycle hire scheme. Data is available back to 2012 and I offered to prep it for her and upload it to Exasol...all 50M+ bike hires worth. I love the weeks when we get to use Exasol because I can ask and answer questions on massive data sets without any performance constraints. The small multiple layout works great or showing cyclical patterns (see what I did there?). The diverging color scale helps accentuate the peak periods. The shading under the lines makes the viz feel more full and complete. Shading the weekends helps separate them from the rest of the weekdays. Putting the word When in red in the title to match the peak period. I would remove the section at the top that says "Boris Bikes" and the image. Include some sort of insight as a subtitle. There's no indication of what the y-axis means. I assume it's the number of bikes hired, but it could just as easily be something else. 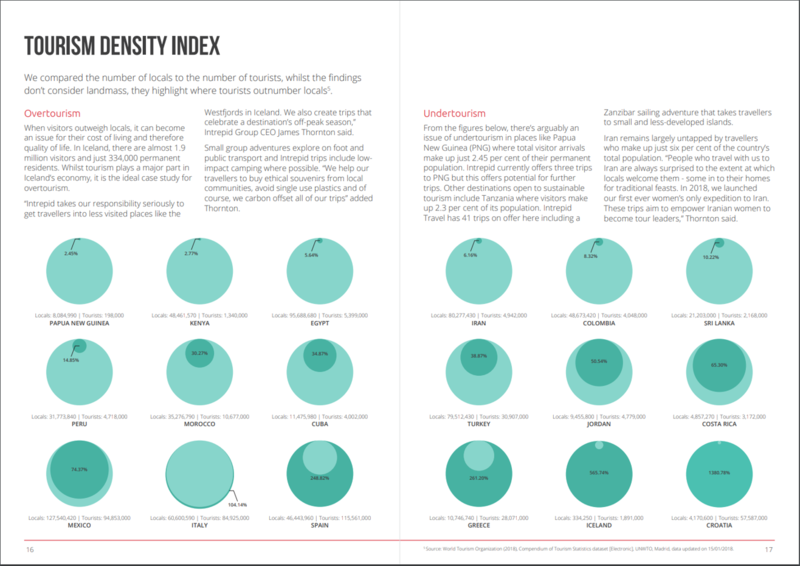 First, I rebuilt Sophie's viz because I like it. I wanted to focus on the weekday and hourly patterns in the data. Use the TFL blue as a single color for the viz. Provide some interactivity so that people could see when the peaks and troughs in the data are for a specific year or month. It was day 1 of Tableau training for DS9 at The Data School yesterday and we were practicing different sorting methods, including sorting by a discrete measure. I was then asked how we could sort positive values from highest to lowest followed by the negative values from lowest to highest. This helps emphasize the best and worst performers. The trick was doing this in a single chart. I've seen lots of headlines in the US since March about how bad the flu outbreak was this year, so I did a bit of googling and found this week's Makeover Monday topic. The chart we are to makeover comes from the CDC. The colors are too bright and are competing for attention. The symbols on the 2017-18 line are unnecessary. 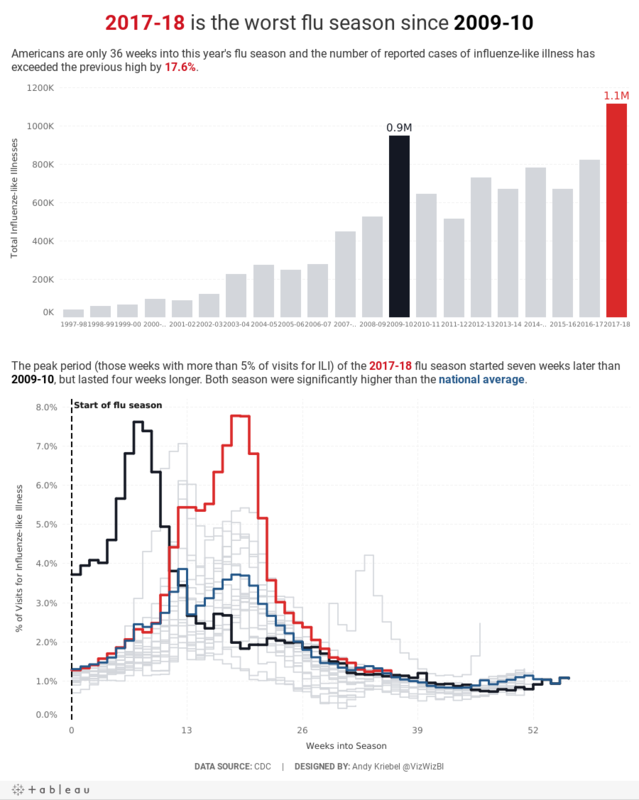 The start of the 2009-10 season is wrong, according to the data that can be downloaded. The national baseline should be weekly, not flat across the time period. I liked the idea behind the original chart, so I kept that but made it look nicer and more focused. I included a summary to set the context for the line chart. I included the national average by week for context. Use a stepped chart to make the weekly change easier to see. Focus the lines on the two outlier periods. If you don't participate in Workout Wednesday, you're missing a great opportunity to learn. 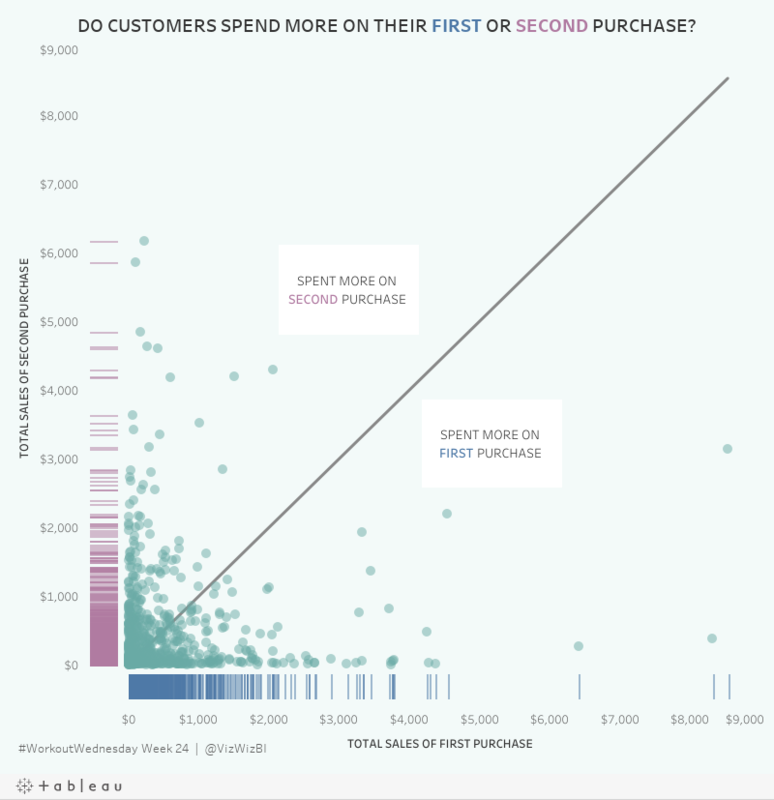 For week 24 2018, Ann Jackson challenged us to also use Tableau Prep. The toughest part of the data prep was getting the second purchase date for a customer. First is easy. The trickiest part is that you can't sort data in Prep, so you have to do some workarounds to get what you need. 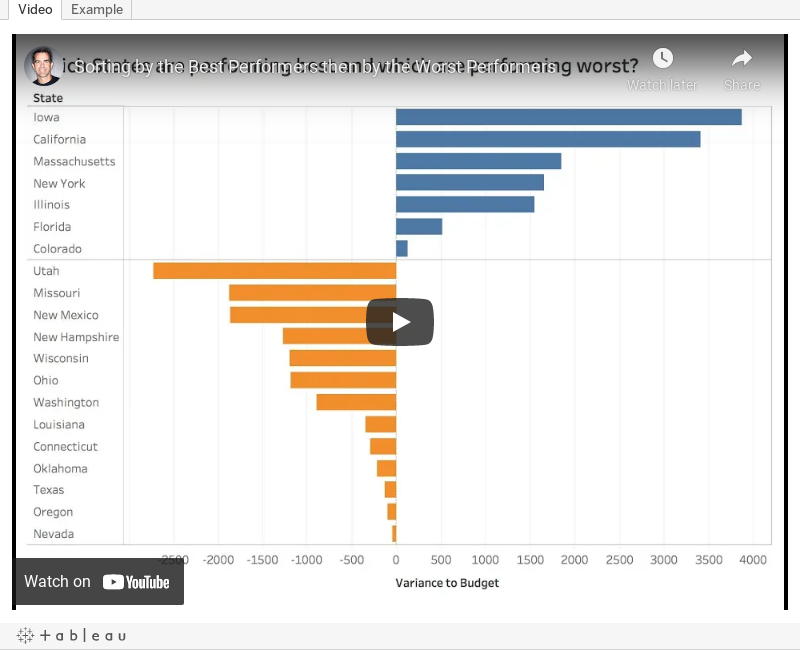 In this video, I should you how I approached returning the first and second purchase dates for a customer, include some summary measures, then bring them both back together into a single table for visualizing in Tableau. Now that the manuscript of the Makeover Monday book (pre-order here) has been sent to the publisher, I'm going to do my best to get back into a rhythm with weekly tips. This week, I'm going to show you how I used Tableau Prep to prepare the data for my Makeover Monday viz this week. It involves splitting eight columns into two sets of four, renaming fields, pivoting the data, and then unioning it all back together. You can download the flow here.